Obama's Rising Approval: Is Tucson Responsible? WASHINGTON -- President Barack Obama has received consistently-good news from recent polls showing modest but consistent improvement in his job-approval ratings since November. How much is attributable to his handling of the shootings in Arizona? Obama does get glowing marks for his Tucson speech and his overall treatment of the incident, but the data we have so far shows that most of the bump took place before the Tucson shootings. 1. 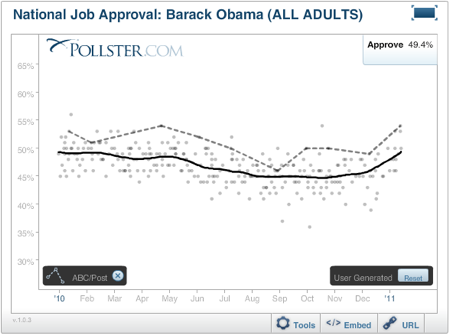 The new polls are unanimous that President Obama's approval ratings have improved since the November elections. The latest result from the new Washington Post/ABC News and CNN/Opinion Research Corporation polls out Tuesday make it 10 of 10 pollsters who have shown Obama's approval rising at least nominally since prior surveys conducted before the lame-duck session of Congress concluded in mid-December. 2. 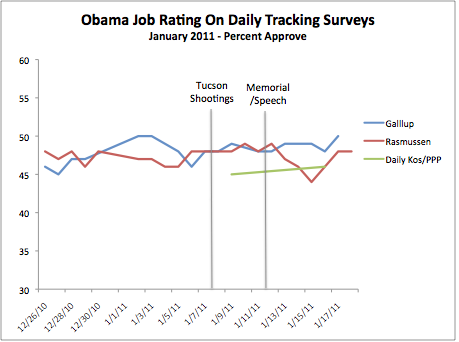 The trend in Obama approval since either the Jan. 8 shootings or his Jan. 12 speech to the memorial service is less clear. Only the Gallup and Rasmussen Reports daily telephone tracking polls and the newly relaunched DailyKos/PPP weekly tracking poll have been in the field in both the last week and during early January, after the lame-duck session. Although the Gallup tracker ticked up slightly Tuesday, the movement within all three polls remains well within their usual range of variation, which is another way of saying it's all within their margin of error. The lack of a clear trend does coincide with overwhelmingly positive marks given the President on his handling of the Arizona shootings the Post/ABC poll -- 78 percent approve of Obama's response to the Arizona shootings. Similarly, a Pew Research News Interest survey released Tuesday reports that among the three out of four Americans who say they saw or heard about the Obama speech, 69 percent rate it positively. Nonetheless, although both the Post/ABC and CNN conducted their surveys after the president's Tucson speech, neither fielded intermediate polls earlier in January. So it is impossible to use their data to determine how much of the "bump" results from Obama's handling of the Arizona shooting. 3. Some may assume that the approval numbers over 50 percent reported by the Post/ABC poll (54 percent) and CNN (53 percent) are comparable to slightly lower numbers reported by Gallup, Pew Research and other pollsters and thus assume the they represent a post-Tucson bounce. However, the approval ratings obtained by Post/ABC and CNN typically track higher, partly because they typically obtain a smaller "don't know" percentage. 4. The Post/ABC poll did produce a significant increase in the percentage of Americans who say that Obama "understands the problems of people like you" from 50 percent last September to 58 percent now. The Post's Chris Cillizza and Aaron Blake conclude that "Obama's rising numbers on the question are almost certainly correlated -- at least in part -- to the speech he gave last Wednesday at a memorial for the victims of the Tucson shooting," and otherwise identify this measure as "one of the most important ways to gauge where a president -- or a challenger -- stands in the eyes of voters." Regular readers will recall my frequently-expressed skepticism about Obama's supposed "connecting" problem, which this new data fails to diminish. Consider how the latest results from the Post/ABC poll compare to similar recent measures by the CNN and Pew Research polls and to Obama's overall approval rating, as represented by our trend estimate of all public polls. Since June, the three measures of empathy show no consistent pattern. While the Post/ABC poll shows an increase in perceptions of Obama's ability to "understand the problems of people like you," Pew Research finds no change in the percentage who say Obama "cares about people like me" (60 percent) and CNN/ORC finds a slight, nominal -- but not statistically significant -- drop (from 60 percent to 57 percent). Notice also the way all three measures move in parallel to overall approval. Even if we accept that the Post/ABC measure captures some increase in perceptions of Obama's empathy that the other polls miss, the direction of causation is unclear. 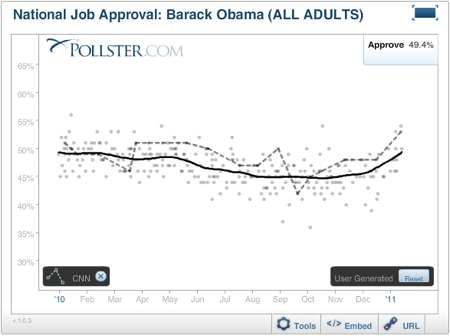 Is Obama's job approval rising because voters suddenly see him as more empathetic? 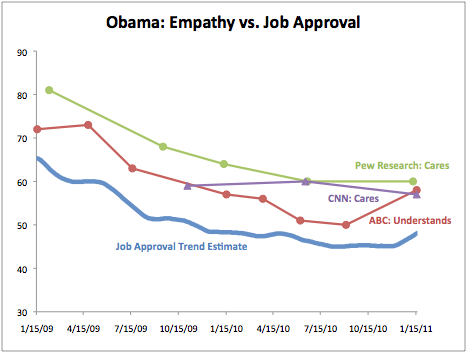 Or are perceptions of his empathy slightly higher because voters are more positive about his overall performance? 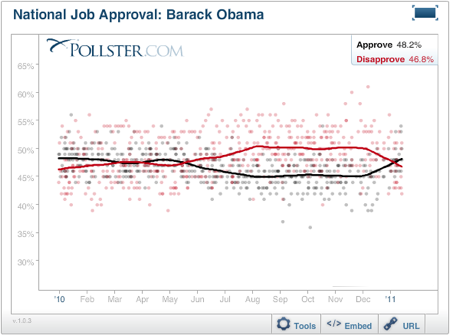 Whatever the source, there certainly has been an increase in the president's job-approval rating over the last month. The more critical question is one tweeted this morning by HuffPost Pollster contributor and Republican pollster Steve Lombardo: Is the increase "ephemeral ... or could it be a turning point?" See our colleague Brendan Nyhan's appropriate skepticism of "turning point" claims. It's simply too soon to tell, and as he writes, "the turning points that matter, will come in the form of economic performance, not dramatic speeches."